All about eggs - Welcome to Jolly Egg Farm! Eggs are one of nature's most nutritious foods, filled with high quality complete protein. In fact, eggs have a biological value (this means the efficiency with which protein can be used for growth) of 93.7%. In comparison, milk is 84.5%, fish is 76% and beef is 74.3%! They contain all nine essential amino acids, as well as many other vitamins and minerals, including vitamin D and B12, riboflavin, folate and iron. One large egg has only 70 grams of calories and 5 grams of fat. Eggs naturally contain cholesterol, but this is actually something that your body needs and produces to help digest food and create Vitamin D. Processed foods that contain hydrogenated oils -- such as pastries, fried foods and snacks --have large amounts of saturated and trans fat, sharply raising blood cholesterol levels and potentially leading to cardiovascular disease. One to two eggs are considered a serving from the "meat and alternatives" section of Canada's Food Guide. The Guide suggests 2 to three servings of different kinds of proteins per day; including foods like meats, fish, seeds and beans. 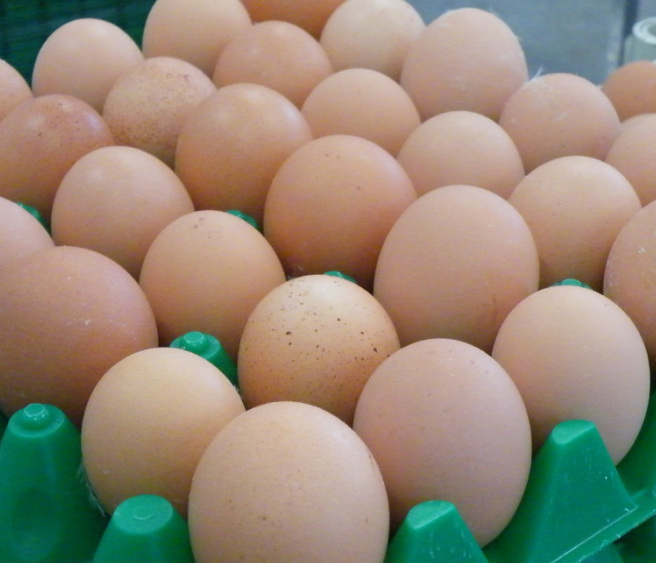 Buying eggs: Look for clean, uncracked Canada grade A eggs at the supermarket. Check the 'best before' date on the end of the carton to see how long the eggs will be at their peak. Eggs need to be kept cool at all times: pick up eggs at the end of your shopping trip and pack them in a bag with something else cold to maintain freshness on the way home. Storing eggs: Eggs should be kept in their original carton to protect them against bumps and also to ward off odours from other food. Place them in the main part of the refrigerator rather than in the door to keep them fresh. Preparing eggs: As with all foods, use the four "Fight Bac!" steps created by the Canadian Food Safety Council. Keep your hands and work surfaces clean. Don't cross contaminate foods (such as allowing juice from raw meat to touch vegetables to be eaten raw). Chill raw food until ready to be used, and cool leftovers promptly. Cook all foods to the required temperature to destroy harmful bacteria.